Iss post me aap janenge ki apne computer yaa laptop me drivers install or update kaise kare. Drivers ek tarh ke software hote hai jo aapke PC ko properly work karne me help karte hai. Agar aapke laptop me kuchh drivers missing hai ya updated nhi to ho sakta hai ki aapka pc sahi se kam nhi kare. isliye apne computer me sabhi important drivers install or update karna jaroori hota hai. Iske liye main aapko ek aise website ke baare me bataunga jisase aap apne computer me sabhi jaruri drivers or apps automatically install or update kar sakte hai. aur isase aapke device me drivers ke problem solve ho jayega. Computer me Driver Install /Update Kaise Kare? 1). sabse pehale aap Driver Pack Solution ki website par jaye. 2). Fir 'Install All Required drivers' button par click kare. 3). isase aapke computer me ek chhota sa software download hona shuru ho jayega. 4). Software download ho jane ke bad apne PC ke download folder me jakar usko install karna hai. Iske liye software file par double click kare..
5). 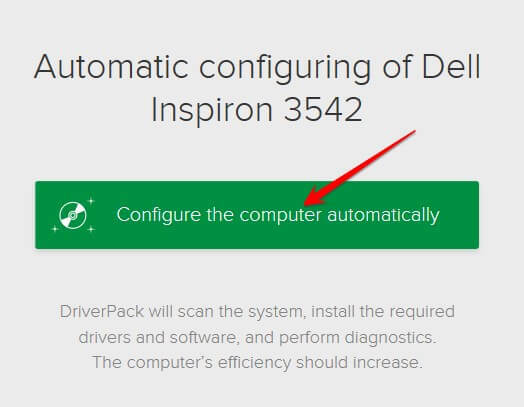 Iske bad 'Configure the computer automatically' button par click kare. 6). Isase Power pack software aapke PC ko scan karega. aapke PC me jitne bhi jaroori or missing drivers /Software hai, wo saare drivers automatically install hona shuru ho jayenge. aur sabhi purane drivers bhi update ho jayenge. Iss tarh se aapke laptop or PC me sabhi drivers problems solve ho jayegi. *Android Mobile se Computer ko Control Kaise kare? *Computer के Folders / Files में Password कैसे लगाये? Mujhe ummid hai ki aapko ye post apne 'computer me drivers install or Update kaise kare' pasand aaya hoga. [How to install and update drivers or apps in PC]. You have just learned how to install or updates drives in your computer or laptop. Using driver pack software, It's very easy to install all required drivers in few clicks. Tags: Install Drivers in PC, laptop me drivers install karna. Hindi me jankari.